Need more information about booking Home 7266250 ? 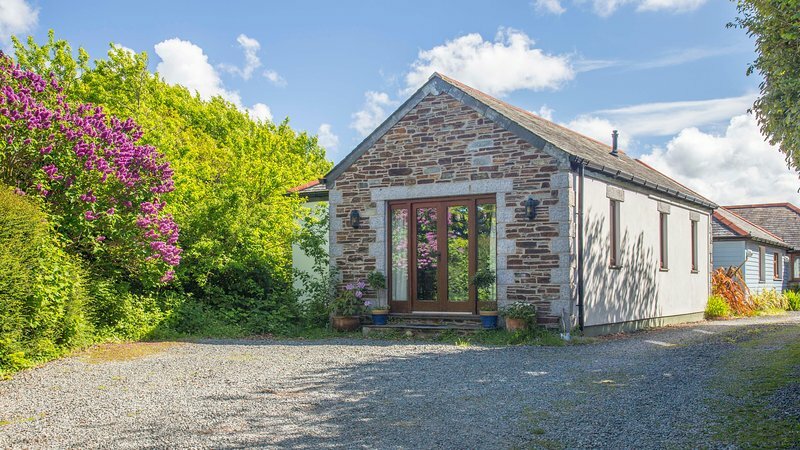 Situated on the side of a tranquil, wooded valley, Trewarden lies off the beaten track in the middle of the Cornish countryside. It is just under two miles from the spectacular cliff-tops and renowned surfing beach of Crackington Haven. With its self-contained guest quarters, Trewarden is ideal for a couple in the double bedroom with a state of the art king-size bed. There is Sky Free Sat TV to entertain you after the invigorating cliff top walks and surfing opportunities for which the neighbourhood is so famous - in winter in front of the gas log fire, in summer on the private decking. For dog owners there are two enclosed fields for them to roam freely as well as a network of National Trust footpaths that criss cross the region between Boscastle and Bude. The bathroom has both a shower and bath with underfloor heating. Should you wish to eat in,Boscastle Farm Shop sells everything from Cornish Specialities, to home-reared meat and locally sourced vegetables. Please bear in mind we have a three night stay minimum. Dog owners please ask if you can bring a well-behaved pet, and please do not allow on the bed or sofa! You can get in touch with Annabel (the owner) through the contact form on this page. Send Annabel (the owner) an email through the contact form on this page. Alternatively, if there’s a phone number on this page, you can call them. How do I contact Annabel (the owner)? If you’ve already booked, go to Manage your holiday booking to view Annabel the owner's contact details or send them a message. Or send Annabel (the owner) an enquiry through the Contact the owner/manager form if you’d like a quote or more info first. When you pay online through the Book your stay form, a booking request is sent to Annabel (the owner). You’ll find out within 24 hours whether they’ve accepted - no money will leave your account before then. You can also request a quote from Annabel (the owner) through the contact form. The owner will email you the total cost for your dates and a link to book and pay online. Use the Book your stay form to pay provisionally online. You can pay by credit/debit card or PayPal. Annabel (the owner) will have 24 hours to accept the booking and no money will leave your account before then. Why can't I call Annabel (the owner) before booking? You’ll need to contact Annabel (the owner) to do this. Send them a message in Manage your holiday booking or through the contact form on this page. You can request to change the dates or number of people on your booking via the Manage your holiday booking page. To change your holiday dates use the Edit booking button. If you need to change the number of guests staying then send Annabel (the owner) a message. If Annabel (the owner) agrees, they’ll send you a revised quote outlining the changes. You can review and accept/decline this from the Manage your holiday booking page. You’ll have 48 hours to take action before the revised quote expires.